If you were at Tuesday Funk this week, then you know something very special happened. And we're not just talking about that extra closeness you experienced with your neighbors in the jam-packed upstairs lounge at Hopleaf. We're talking about what happened behind the microphone, and sister, was it something. Jodi Eichelberger's tale of being the lone audience member at a solo mime/dance performance in London. Maggie Kast followed that will a powerful novel excerpt about a young Chicago activist arriving in Alabama for the infamous Scottsboro trials of 1931. And Stephen Markley's brought the house down with his gonzo, hallucinogen-assisted reportage from the Republican debate that dashed Rick Perry's presidential hopes. After a break for beer, co-host William Shunn busted out this month's Poem by Bill, "Like Writing a Bicycle." Then we rounded out the evening with two remarkable selections from the new 2nd Story anthology Briefly Knocked Unconscious by a Low-Flying Duck. There was not a dry eye in the house as co-editor Andrew Reilly wrapped up his story of a vacation romance in India, and every knuckle in the place was white while Julia Borcherts explained what brought her and her infant daughter to the scene of a gruesome late-night murder in 1981. Funk #52 was truly the Funk by which all future Funks will be judged. But if you weren't there, don't despair. 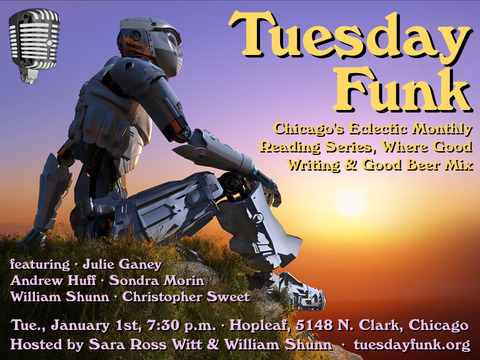 We'll be bringing you video clips from the evening over the days to come, after which we'll be back January 1st, New Year's Day, with a great lineup featuring Julie Ganey, Sondra Morin, Christopher Sweet, William Shunn, and more. Don't miss it! Reminder: Tuesday Funk #52 is tonight! 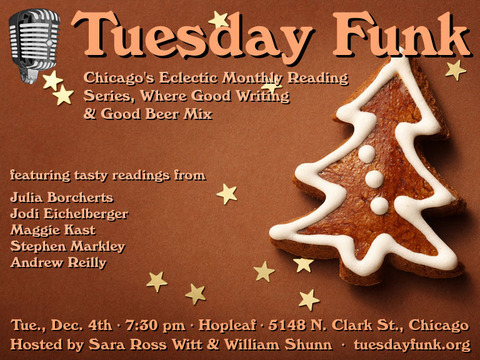 Come kick off the holiday season in style tonight with your friends at Tuesday Funk, Chicago's eclectic reading series where good writing and good beer mix! It our 52nd big episode, and we're pleased to present the first in a series of readings featuring authors from the new 2nd Story essay anthology Briefly Knocked Unconscious by a Low-Flying Duck. Julia Borcherts and Andrew Reilly will be on hand to read their contributions, and we'll also have Jodi Eichelberger, Maggie Kast, and Stephen Markley with us. Throw in one of our patented Poems by Bill, not to mention your pick of cold beers from around the world, and you have the recipe for a fantastic hour or two of live literature. 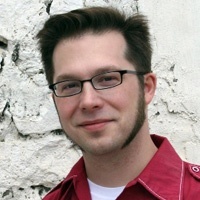 So "like" us today on Facebook and get set to pour out some holiday cheer with hosts Sara Ross Witt and William Shunn. Hopleaf Bar is at 5148 N. Clark St. in Chicago. The reading begins at 7:30 pm in the upstairs lounge. The lounge opens at 7:00 pm. Arrive early if you want a seat. As always, the upstairs lounge at Hopleaf is 21 and over only. Remember also that no food can be brought in from the restaurant. 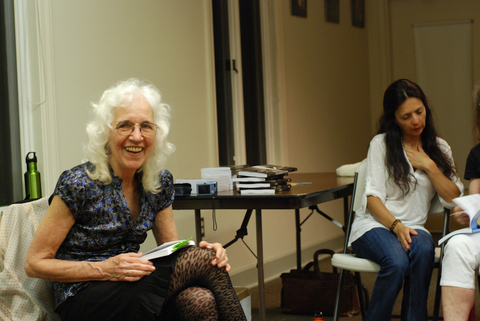 Maggie Kast is the author of The Crack Between the Worlds: A Dancer's Memoir. Her stories have appeared in The Sun, Nimrod, Rosebud, and others, and essays in America, Writers Chronicle, and Image. She's currently at work on a novel, I Never Knew You Had a Girl, an excerpt from which, "Sleeping with Men," has just been published by Red Claw Press as part of an anthology on sleep, Seek It: Writers and Artists Do Sleep. Her essay "Symbols: Forest of Ambiguity" is forthcoming in the online magazine, Numéro Cinq: A Warm Place on a Cruel Web. 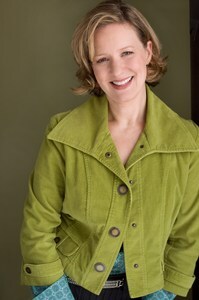 Hear Maggie and the rest of our outstanding readers on Tuesday, December 4, 7:30 pm, in the upstairs lounge at Hopleaf.